(Photo Courtesy/Mike Beiermeister) Pączki cool down from the deep fryer, awaiting glaze, sugar, and jelly. 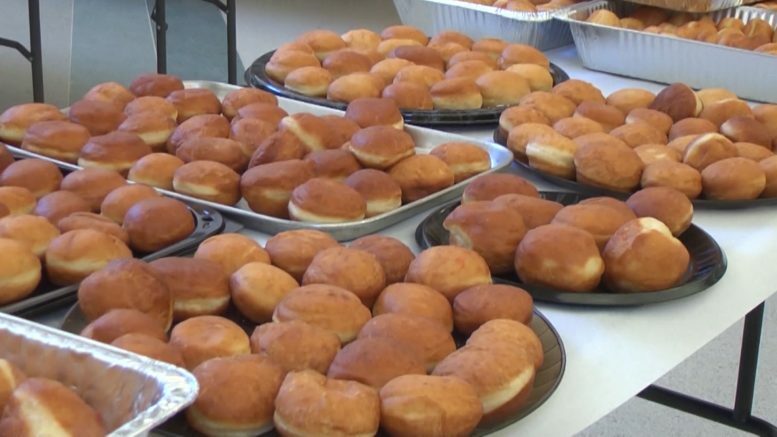 Alpena, Mich. — On Saturday, folks could pick up their pączki, but this most sought after fried donut wasn’t around for long. It started around 4:00 a.m. in the community room at St. Anne’s Catholic Church. “we had people frying. we had people rolling and cutting,” said Co-chair of the event, Julie Kowalski. Volunteers ran through steps of creating the perfect pączki. First, a fine dough was created with hundreds of pounds of flour and hundreds of eggs. Once the dough was assembled, volunteers would move it to a warm room. Once the pączki rise up, they visit the deep fryer. After a soak, it’s time to let them sit, awaiting jelly, powder sugar, and frosting. “it’s just a great team effort,” said Gougeon. Young and old, each volunteer has a role and plays a part. This year was special. It’s the first time all of the pączki had been sold out before the 4:00 p.m. mass. It was a record hour and 25 minutes. “people look forward to it and, they start talking about it months before, can’t wait to come and get the pączki, so it was a very busy day,” said Kowalski. The money raised from the sale will benefit the All Saints Parish community as well as the Alpena community in various ways.